The listening service, or "Ahrendstationen", was formed towards the end of 1915, but it was only in January 1917 that these became independent units. In February 1917 there were 22 Arendt-Abteilungen . In March 1918 they were restructured into 292 Arendt-Stationen. Of these, one was attached to each division leaving a number free as a reserve. The staffs of the now defunct Abteilungen were reassigned to the Akonach and Grukonach to process the information from the messages picked up by the stations. Until 1916 there was a carefree exchange of conversation on the field telephone lines. There were few apparent dangers and no conceivable negative effects. At some point in 1916 the Germans began to suspect that their communications were being overheard. This suspicion was confirmed when special communications equipment was discovered in a captured enemy trench. The fact that the enemy could branch themselves directly onto a telephone line was not the issue as the telephone lines ran behind the German positions, rather, the enemy was using the electrical current in the earth to listen in. A field telephone operated in an electrical circuit, the message only being transmitted when the current went from the sender to the receiver and back again. This required 2 cables between telephones. An alternate system had been developed to save the confusion that would be caused by having double the amount of cables being strung between positions. The second wire, instead of being connected between the two telephones was connected between the telephone and a steel peg or bayonet, which in turn was stuck into the damp earth, in this way the current would be carried by the earth from one telephone to the other. The catch was, the current did not travel directly from one bayonet to the other, but radiated in all directions. If one was to put another cable into the ground, a "searcher cable", it was possible to pick up these currents, usually to weak to be of any use. With a system of valves and special light bulbs the enemy had succeeded in increasing this current to a point where he could listen in on the telephone conversation of the German signalers. The Germans immediately tried to implement counter measures, including running an "earth wire" with a length of 4-500 meters behind their line. This did not seem to have any effect, so they were forced to do away with the earthing system and run double lines between telephones. It was soon discovered that only telephone lines in perfect condition were secure. Any slight damage to the isolating cover would mean the wire would give off current and this in turn would radiate to enemy listening posts. The German signalers did not take long in creating their own listening stations, named "Ahrendtstationen" after their founder. These rapidly surpassed the technology and efficiency of the enemy stations. Signalers would often sneak across no mans land and earth their searcher cables directly in front of the enemy positions, or alternately attach them to the enemy barbed wire, which acted as a superb conductor. The results were extremely satisfying to the German high command. 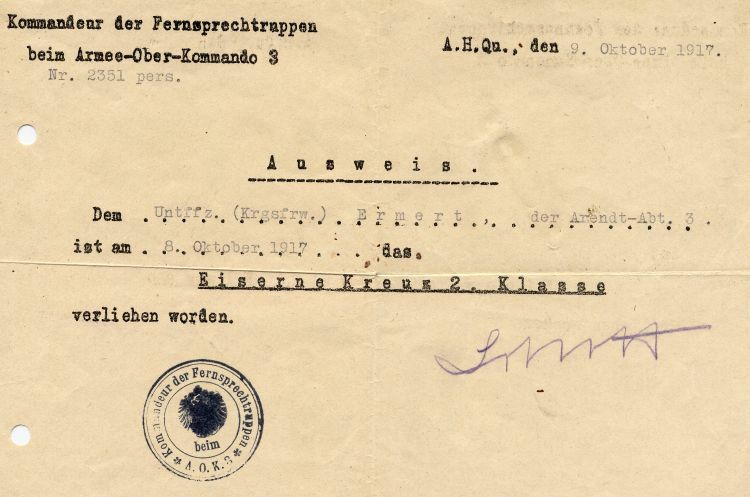 Above: The Iron Cross award document to a member of the Arendt Abteilung of the 3rd Army Headquarters. It did not take long for the enemy to realize that the Germans now also had listening posts. The counter measures were limited, as on the German side, to implementing a double wire system. This could not prevent the enemy listening in, but did limit the amount of traffic he could listen to. Both sides imposed strict control on telephone conversations, including the content and frequency. Lines not of tactical necessity were removed and front line units were limited to only the bare minimum of calls, once again limited to those of tactical necessity. The Arendt-Stationen, in addition to their task of listening in on enemy conversations also listened for enemy tunnelers and miners as well as being responsible for listening in on German conversations. All conversations, both enemy and friendly, were recorded and sent to the rear to be controlled. This allowed the staff to sanction those who had breached the rules related to telephone security and access what information may have been intercepted by enemy listeners.